Seemingly as soon as they start, the holidays are over. The dust settles, and you finally have some time to breathe. Then you remember all the parties, the holiday guests, and the merriment. You remember the mess. 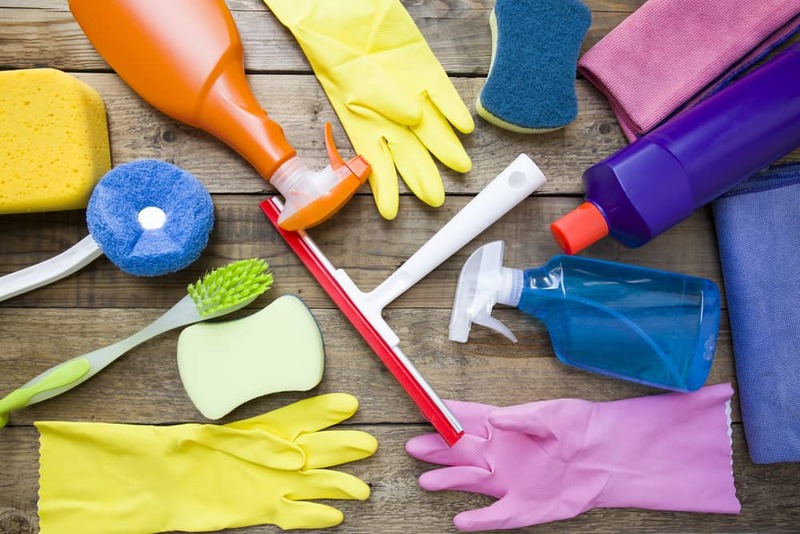 If you are hosting the family for the holidays, then here are some basic house cleaning tips to help you start planning a post-holiday cleaning campaign. We all tend to accumulate stuff during the holiday season. And while it is always great to give gifts, it isn’t always so great to find your kitchen full of used storage containers, your trash bins full of waste, and your storage areas full of unwanted decorations and odds-’n-ends. Get rid of all your trash, including all the wrapping paper, ribbons, and bows that you don’t need. You don’t need to prepare for next year’s Christmas before the new year. Return any old food containers left over from parties. You don’t need them, and you don’t want them. If the original owner refuses (or continually forgets) to take them, then trash or donate them. Store your decorations, tree, and other holiday items correctly, and put them away no later than 18 days after Christmas. That includes exterior lights and law decorations. Finally, give your home items a good once over to assess if there is anything that could be donated or thrown away. The new year is a time for declutter and rebirth, so take the opportunity after the holidays to clear the decks. You’ve held your parties, you’ve cooked for company, and you’ve baked dozens of cakes, pies, and cookies. 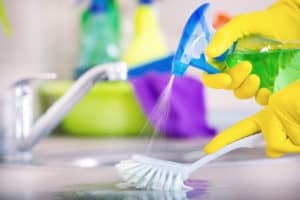 Now it is time to step back from the festivities and deep clean your kitchen. The inside of your refrigerator and freezer. The external parts of your mixers and blenders. The interior and exterior of your oven and dishwasher. The sink, including the under-sink area. The interior and exterior of your cabinets and drawers. You can use a disinfecting cleaner or a basic mix of baking soda, vinegar, and water. There are also several natural cleaners that can provide the level of cleanliness and odor protection you need. We normally try to avoid harsh cleaning chemicals on any surface. In any case, scrub all these surfaces down. You don’t want to come across food stains or worse a month down the road. Take the opportunity to make your kitchen new and feel good again. You and your family have been sitting on your furniture all winter. And, if you’ve hosted during the holidays, it’s been more than just your family. And let’s not even get into pet odors. It’s time to get your upholstery cleaned. In all honesty, this is something you should do 1-2 times a year at minimum, so post-holiday season is usually a great time to do it. Since your windows have been most likely shut against the cold for months, with the heater running, and your family (and any party guests) regularly in residence, your furniture will most likely need cleaned. Vacuum all your fabric furniture. This will help remove any errant dirt, hair, and stains. Spot clean any stains. Long-lasting wine or grape stains probably won’t come out after the fact, but it doesn’t hurt to try and remove some dirt beforehand. Spray with a mixture of water and essential oils. Using diluted essential oils can freshen up fabrics before they are cleaned and keep your living and entertaining spaces smelling pleasant. We recommend fresh and clean scents like mint, lemon, or fresh herbs. Of course, you should also call your furniture cleaning specialist. They can help get smells and stains out of your furniture and keep it fresh for the upcoming spring. 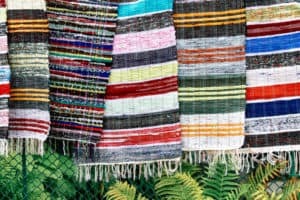 Like furniture, area rugs are going to accumulate stains, dirt, and odor. And like your furniture, there are a few at-home steps you can take to get them clean. A simple thing to do is to let them sit outside. Pick a warm day with no rain, and gently shake your rugs out and hang them on a balcony. This will not only remove dust, but also help remove odor. Following that, you can attempt to clean the rug yourself (and it helps if the rug is washable). However, washing and cleaning can be hard on your rug if you don’t have the right equipment. We recommend that you brush your area rug out with a rough brush to pull up hair and dirt. Then call your carpet cleaner to help you take care of all your rugs in one swoop. This is especially useful if you have antique or oriental area rugs that need special care. Finally, pick up all your furniture and clean that carpet. It has taken a beating over the winter: long days with lots of people inside, muddy shoes, parties, pets, you name it. And you would be amazed at how much a carpet cleaning freshens up your home. If you have a combination of upholstered furniture, area rugs, and carpeting to clean, then make an appointment with your holiday cleaners. A good cleaning company worth their salt will probably offer package deals on cleanings and can provide you with a more comprehensive approach to cleaning your fabrics. But we’re serious when we say get your carpets clean. You should have an annual carpet cleaning scheduled anyway, so why not set it up at the end (or beginning) of the year? And don’t start off the year by cleaning your upholstery with a dirty rental cleaning machine. Work with a professional crew that can get everything clean, disinfected, and fresh for the new year.